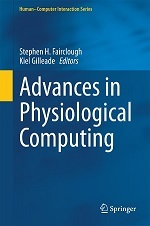 This entry was posted in Musings and tagged affective computing, BCI, biofeedback, concepts, physiological computing, telemedicine on December 9, 2009 by Steve Fairclough. I follow your blog for a while but here is my first comment. With regards to the name of physiological computing (precedent post) I agree with you that this name is correct as long as this is a borad category that regroup ohters (like physiological emotion assessment and even more specifically emotion assessment from brain signals). With regard to the proposed sub-categories I also like them but I will critic a bit the way you present them on this scale. 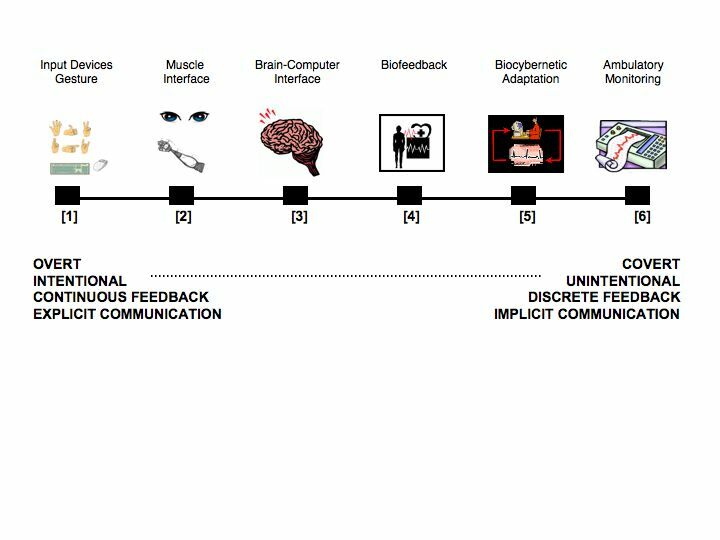 First I disagree with the continous / discrete feedback: I do not see why biocybernetic adaptation or ambulatory signals are discrete. I understand that for instance ambulatory systems give alerts only at some moments in time but in my view this remains continous since it can be at any moment (one can also say that the system continously outputs “no problem”). Second I wonder if this scale is really continous (i.e. is it possible to say for instance that a muscule interface has “more continous feedback” than a biofeedback system or that communicating with gestures is more explicit than with muscles). In my view those factors are more distinct properties of a given system. For instance, a BCI can be unintentional with continous feedback. Thirs it would be interesting to define the difference between the overt, intentional and explicit factors which in my view are the same. Coming back to the continous scale discussion I believe that a system is designed to fall in one of those categories (say intentional or not for instance) but it sometimes happen that the communication do not follow the expected design (becomes unintentional like when a BCI command is wrongly detected). ANother example is also an unintentional communication (like affective feedback) that becomes intentional (imagine a person able to control his/her physiological signals and fake an emotion). In this sense, yes, I agree that there might be some kind of continious scale representing an “in-between system”. But this is rather a side effect of the system rather than his design objective. Anyways thanks for this blog, this nomenclature and this interesting discussion. I don’t fundamentally disagree with the points you make about the weakness of the continuous/discrete dichotomy. The concept I was trying to convey was how some systems which are used as input devices present high fidelity feedback. For example, moving a cursor with eye movements provides continuous feedback of the relationship between physiology and events at the interface. Other systems, such as ambulatory monitoring, do operate continuously from the perspective of the sensor, but from a user interface perspective, provide a lower fidelity of feedback as data may be blocked into minutes or hours and reviewed on a retrospective basis. The continous/discrete dichotomy is meant to represent the time fidelity of feedback at the interface. I agree that the overt/intentional/explicit categories seem to be saying the same thing and a good deal of overlap exists here. The key difference is between a system detecting a pattern of physiological activity that the user intends to produce vs. those wiretapping systems that normally fall into the category of affective computing where the physiological pattern occurs without intention on the part of the user. It seems to me that perhaps intentionality is the key distinction here. Your example of a user ‘faking’ an emotion for an affective computing system really brings that point home.